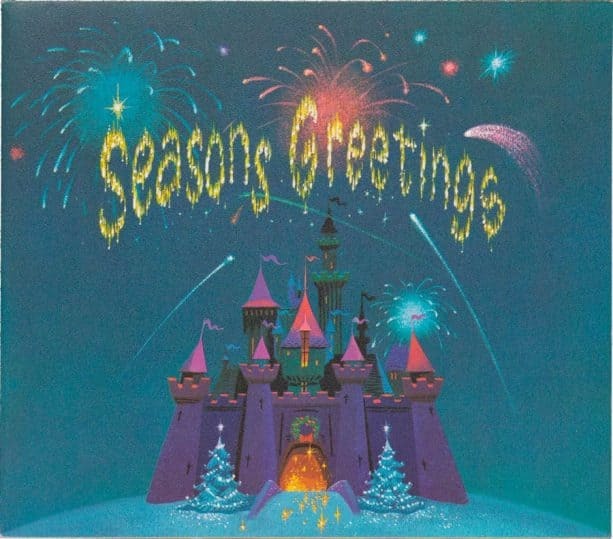 Early in the history of the Walt Disney Studios, annual Christmas-themed greeting cards were created featuring designs and illustrations by such legendary studio artists as Tom Wood, Hank Porter, Bob Moore, Mary Blair, John Hench, and Paul Wenzel. 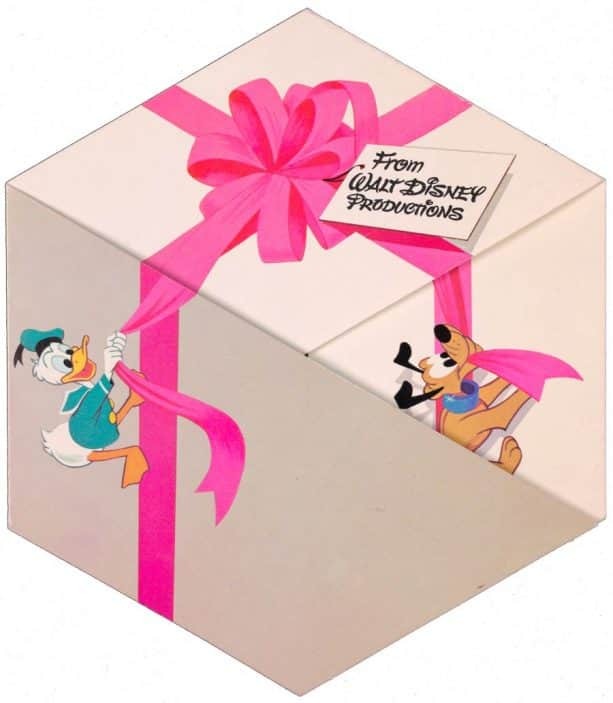 Over eight decades, the artists of the Walt Disney Studios also created annual seasonal artwork for merchandise, greeting cards, advertisements, and publications, and in support of motion picture releases, television programs, and the Disney Parks & Resorts. 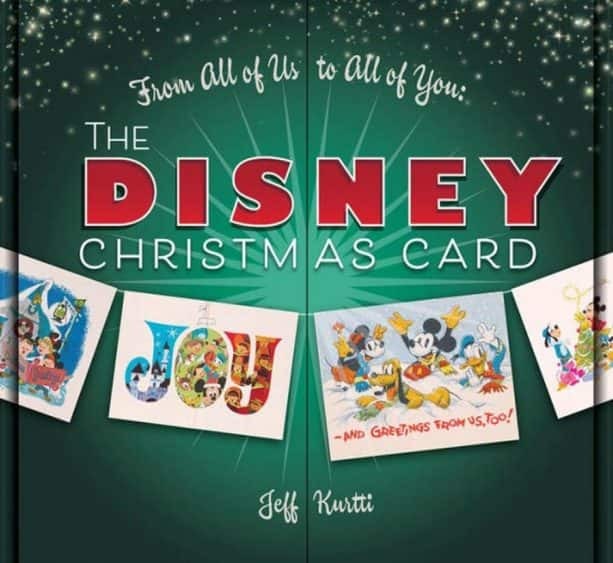 “What makes the Disney Christmas cards special were that they meant you were part of the family,” historian and author Jim Korkis says. 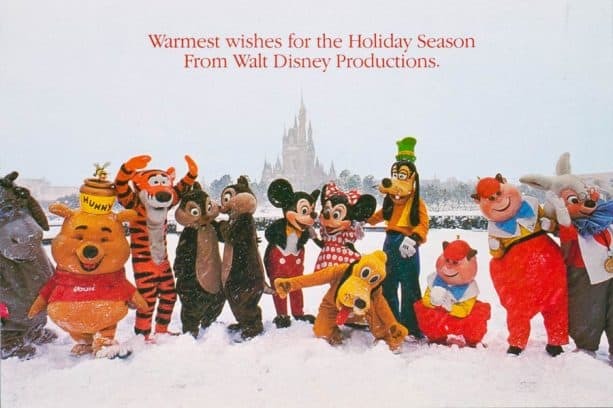 Indeed, Disney Christmas cards are like those annual family update letters you get from far-off relatives. 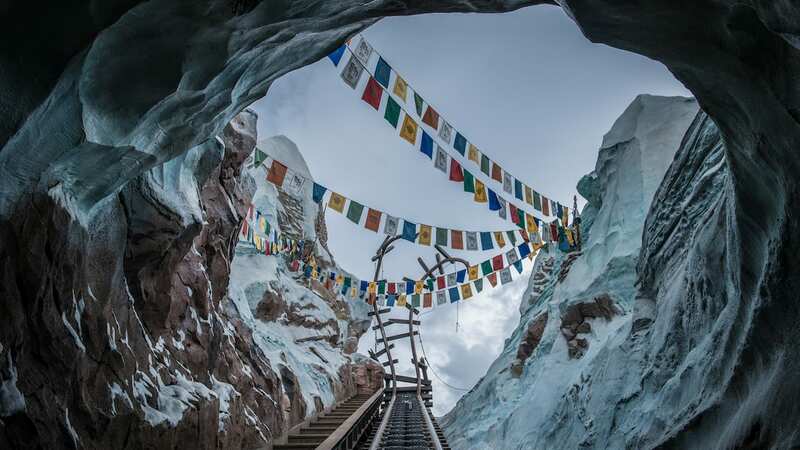 In the case of the Disney cards, the update was typically about a current or upcoming film release, or after 1955, the latest news in what was then called “outdoor entertainment,” but we know today as Disney Parks & Resorts. This 1955 card by an uncredited Disney Studio artist celebrated the successes and heightened public awareness of the Disney organization. Walt had conquered the medium of television with the Disneyland and Mickey Mouse Club TV programs, and the interior of this card featured a calendar for the following year commemorating the opening of Disneyland park to thunderous acclaim the prior July. Studio artist Paul Wenzel created this art for the 1959 card. Only five years after the premiere of the Disneyland TV series (and four years after the opening of the actual park), Sleeping Beauty Castle had become an immediately recognized symbol of all that Disney represented in terms of fantasy, imagination, and entertainment. Studio Art Director Bob Moore became fascinated with paper engineering in the 1960s and 1970s, and this 1971 card featured an intricate hexagonal folding design, and represented the great gift of the recent opening of Walt Disney World Resort in Florida. 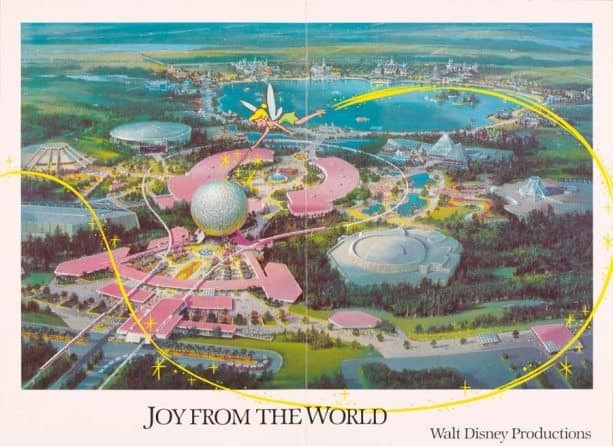 For the 1982 card, a familiar pretty petite pixie flies over Disney Imagineer Clem Hall’s lavish and detailed conceptual aerial view of EPCOT Center (now Epcot), the enormous and innovative new Disney park concept that had just previewed the 21st Century before thrilled crowds at Walt Disney World Resort. 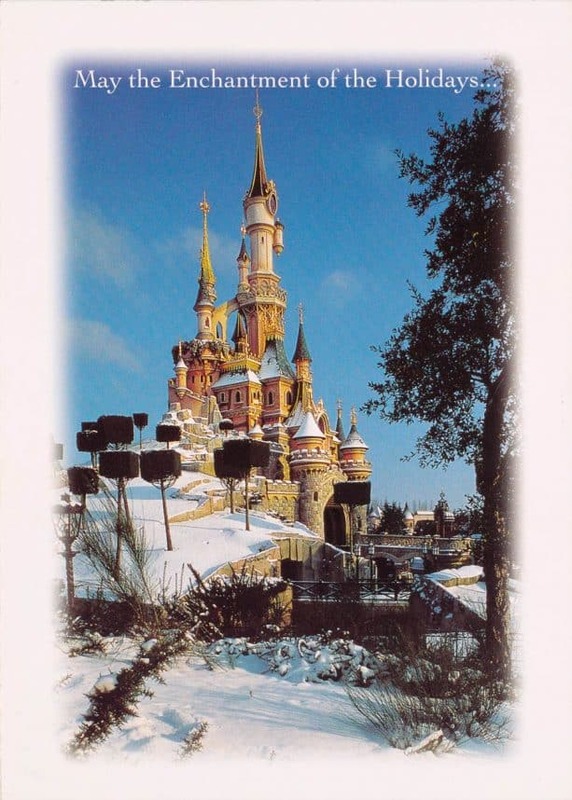 As had been the case in Tokyo in 1983, Disneyland Paris saw an unusual snowfall in 1997, and the photographers were ready. A winter fantasy of Le Château de a Belle au Bois Dormant opened to reveal a holiday greeting from Mickey. The annual company holiday card has for decades been an example of corporate pride in achievements of the year past or a preview of the year to come. 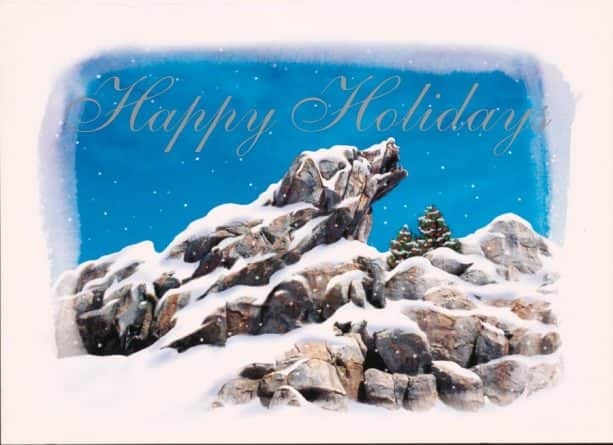 Celebrating the opening of Disney California Adventure park, the 2000 card featured a “snowcapped” Grizzly Peak, the mountain icon of the new park. Wonderful post about a wonderful book. And I can’t tell you how happy I am to see Mr. Kurtti contributing to the Disney Parks Blog. While it’s fun to see posts about current events, having such a well-respected historian giving us glimpses into the company’s rich history serves as a welcome reminder as to why we fell in love with Disney in the first place. Great and informative piece! Love seeing this on the parks blog where more readers can know and appreciate more about the history of the Walt Disney Company! Great book for every library as well!!! This beautiful book is a must have for Disney fans! The artwork throughout the book is bright and stunning. Learning about some of the talented artists behind these cards was fascinating! It’s definitely going to be on my coffee table each holiday season. Thank you Jeff Kurtti for another must have Disney book! I had my copy pre-ordered and I was wasn’t disappointed when it arrived! The artwork on the cards is beautiful and the book goes in depth about a topic that I feel hadn’t been thoroughly explored until now. The author was also super knowledgeable and kind when I met him recently at a book signing! Hinted to hubby that I wanted this when I saw it at the Contemporary. I hope it’s under the tree. Such an amazing book. I have the maps book and love it. Your work is so special. Thanks for making these books. Welcome to the blog Mr. Jeff! OMG! They are all so beautiful and magical.